In contrast with the American Federal attitude that navighation works are for cargo carrying, in the United Kingdom canal cargo carring stopped about 1960, yet improvement, and even construction, continues. England, hardly big enough to be a state in the USA, has about 2000 miles of canals. Canal locks typically limit boat size to 65 feet in length, 7 feet in widthy, and a draft of 3 feet. Bridges limit height to about 6 feet. By developing good, safe waterways for cruising, Britain has developed a large recreational boating industry which draws thousands of visitors from overseas each year, in addition to providing recreation for British families. "Canal holidays" on rental boats are an industry employing hundreds of people, in addition to hundreds more jobs in building, maintaing, and supporting private craft. When we realized we were allowed to participate in West Virginia University's retirement incentive, we decided to buy our own boat in England. Dawn Adventure is our second canal boat. Our first was a 25 foot version of this builder's series with a 10 HP outboard. We try to spend at least three weeks each year in the spring and another three weeks in the fall living aboard. 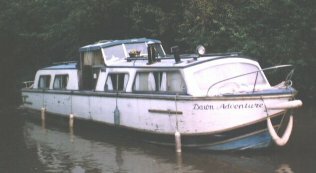 Dawn Adventure was sold in March 2006. Click here for details.